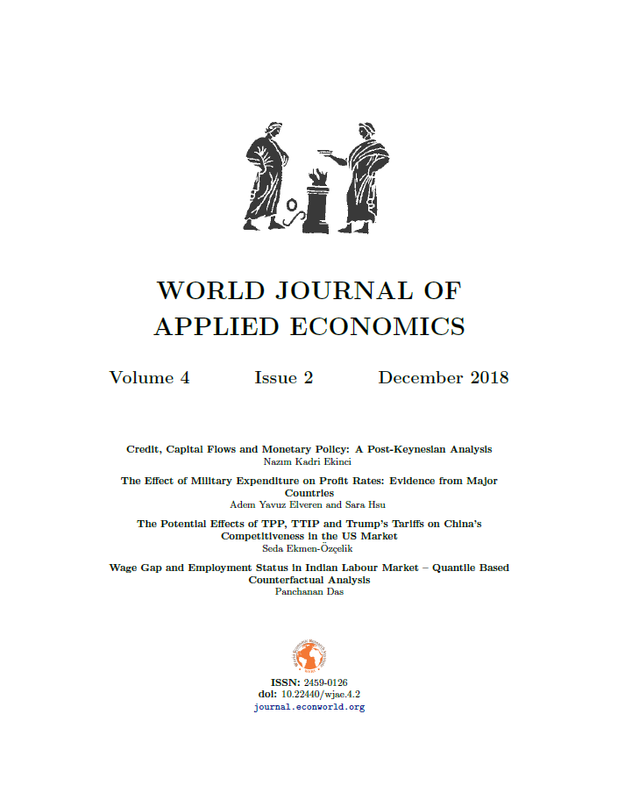 This article provides evidence of the effect of military expenditures on the rate of profits by focusing on 32 major countries for the period of 1963-2008 by using data from the Extended Penn World Tables, the University of Texas Inequality Project Estimated Household Income Inequality, the World Development Indicator, and the Stockholm International Peace Research Institute. The article employs a Generalized Method of Moment model within a Marxist framework. Findings show that military expenditures have positive effect on the rate of profits. It is also showed that increasing income inequality increases the rate of profits. Finally, the findings suggest that while military expenditures have a positive effect on the profit rates in the case of both armsexporting countries and net-arms exporters, the relationship is not that significant in the case of arms-importing countries. Baltagi, B. H. (1995). Econometric Analysis of Panel Data. Wiley. Baran, P. A., & Sweezy, P. M. (1966). Monopoly Capital: An Essay on the AmericanEconomic and Social Order. Monthly Review Press, New York and London. Bond, S. (2002). Dynamic Panel Data Models: A Guide to Micro Data Methods and Practice (Centre for Microdata Methods and Practice (CEMMAP) Working Papers No. CWP09/02). Coulomb, F. (2004). Economic Theories of Peace and War. Routledge, London and New York. Dumenil, G., & Levy, G. (2011). The Crisis of the Early 21st Century: A Critical Review of Alternative Interpretations [Mimeo]. http://citeseerx.ist.psu.edu/viewdoc/download?doi=10.1.1.473.5051&rep=rep1&type=pdf. Dunne, J. P. (1991). Quantitative Marxism. Cambridge: Polity Press. Dunne, J. P., Pieroni, L., & d'Agostino, G. (2013). Military Spending and the Falling Rate of Proft in the US [Mimeo]. Dunne, J. P., & Uye, M. (2010). Military Spending and Development. In A. T. H. Tan (Ed. ), The Global Arms Trade: A Handbook (p. 293-305). Routledge, London. Elveren, A. Y., & Dunning, R. (2017). Do Military Expenditures Boost Proft Rates? (Munich Personal RePEc Archive (MPRA) No. 81143). Elveren, A. Y., & Ozgur, G. (2018). The Effect of Military Expenditures on the Proft Rates in Turkey (Munich Personal RePEc Archive (MPRA) No. 88848). Engels, F. (1877). Anti-Duhring. http://www.marxists.org/archive/marx/works/1877/anti-duhring/ch15.htm#061. Engels, F. (1893). Can Europe Disarm? In Karl Marx Frederick Engels Collected Works. Estimated Household Income Inequality. (2017). https://sites.google.com/a/newschool.edu/duncan-foley-homepage/home/EPWT. Extended Penn World Tables. (2018). https://utip.lbj.utexas.edu/. Foley, D., & Marquetti, A. (1997). Economic Growth from a Classical Perspective. In International Colloquium on Money, Growth, Distribution and Structural Change: Contemporaneous Analysis. https://pdfs.semanticscholar.org/85d8/d0f3fca9c9c1e42fb72992c4503979811440.pdf. Galbraith, J. K., Jiaqing, L., & Darity, J. W. A. (1999). Measuring the Evolution of Inequality in the Global Economy (University of Texas Inequality Project (UTIP) Working Paper No. 7). Green, D. W., & Higgins, C. I. (1977). SOVMOD I: A Macro-econometric Model of the Soviet Union. Academic Press, London. Hsiao, C. (1986). Analysis of Panel Data. Cambridge University of Press, Cambridge. Hunt, E. K. (1972). Property and Prophets. Harper and Row, New York. Kaldor, M. (1977). The Role of Arms in Capitalist Economies: The Process of Overdevelopment and Underdevelopment. In D. Carleton & C. Schaerf (Eds. ), Arms Control and Technological Innovation. Croom Helm, London. Kalecki, M. (1972). he Last Phase in the Transformation of Capitalism. Monthly Review Press, New York. Kidron, M. (1970). Western Capitalism Since the War Revised Edition. Pelican Books, Harmondsworth. Luxemburg, R. (1913). The Accumulation of Capital. Mansfeld Centre, CT: Martino Publishing. Maito, E. E. (2016). The Historical Transience of Capital Datasets [Mimeo]. https://uba.academia.edu/EstebanMaito/The-Historical-Transience-of-Capital-Datasets. Mandel, E. (1978). Late Capitalism. Verso, New York. Marx, K. (1848a). Manifesto of the Communist Party. https://www.marxists.org/archive/marx/works/1848/communist-manifesto/index.htm. Marx, K. (1848b). The Discourse on Free Trade. www.marxists.org/archive/marx/works/1848/free-trade/. Melman, S. (1965). Our Depleted Society. Holt, Rinehart and Winston, New York. Ochoa, E. M. (1984). Labour Values and Prices of Production: An Interindustry Study of the US Economy, 1947-1972 (PhD Thesis). Ann Arbor, MI. O'Connor, J. (1973). The Fiscal Crisis of the State. St Martin's Press, New York. Purdy, D. (1973). The Theory of the Permanent Arms Economy-A Critique and an Alternative. Bulletin of the Conference of Socialist Economists, 5 (1), 12-33. Reich, M. (1972). Does the US Economy Require Military Spending? The American Economic Review, 62 (1/2), 296-303. Roberts, M. (2012). A World Rate of Proft [Mimeo]. http://thenextrecession.files.wordpress.com/2012/09/a-world-rate-of-profit.pdf. Roodman, D. (2006). How to Do xtabond2: An Introduction to "Difference" and "System" GMM in Stata (Center for Global Development Working Paper No. 103). Roodman, D. (2009). How to Do xtabond2: An Introduction to Difference and System GMM in Stata. Stata Journal, 9 (1), 86-136. Rowthorn, B. (1980). Capitalism Conict & In ation Essays in Political Economy. Lawrence and Wishart, London. Shaikh, A. (1984). The Transformation from Marx to Sraffa. In E. Mandel & A. Freeman (Eds. ), Ricardo, Marx, Sraffa: The Langston Memorial Volume (p. 293-305). Verso, London. SIPRI (Stockholm International Peace Research Institute). (2017). www.sipri.org. Tasiran, A. C., & Elveren, A. Y. (2017). Soft Modelling of Military Expenditures, Inequality and Profts [Mimeo]. https://www.aeaweb.org/conference/2017/preliminary/paper/DRSifQkh. Theil, H. (1972). Statistical Decomposition Analysis: With Application to the Social and Administrative Science. North Holland, Amsterdam and London. Tongur, U., & Elveren, A. Y. (2017). The Nexus of Economic Growth, Military Expenditures, and Income Inequality. UTIP (University of Texas Inequality Project). (2018). http://utip.lbj.utexas.edu/. Weisskopf, T. (1976). Theories of American Imperialism. In D. Mermelstein (Ed. ), Economics: Mainstream Reading and Radical Critiques. Random House, New York.